Starting Tuesday morning, Texans will be able to obtain naloxone, which can help prevent a drug overdose from being fatal, without a prescription at any of 715 Walgreens pharmacies in the state. Miles McEntee died on June 2, 2015 of a heroin overdose in the apartment he shared with his sister, Taylor, right. 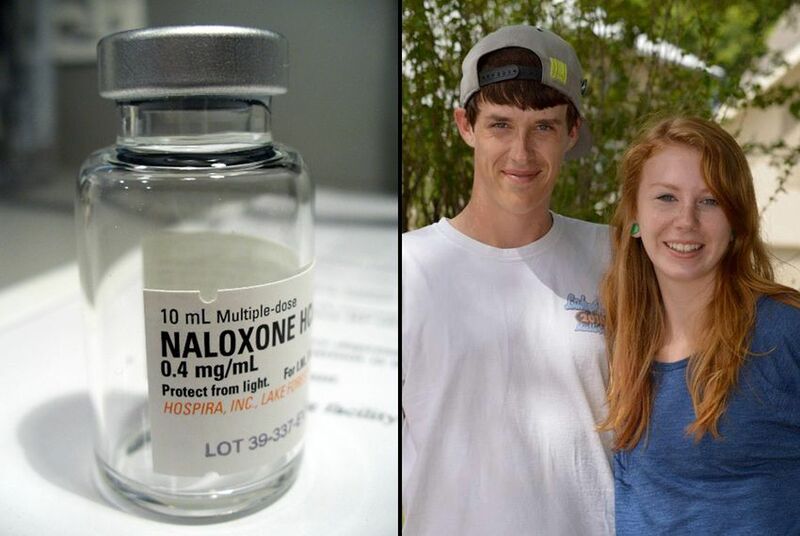 Their mother wonders whether naloxone might have saved his life. Just before his 25th birthday, Miles McEntee died of a heroin overdose last June in the Austin apartment he shared with his younger sister. Kelly McEntee wonders if her son might still be alive if he or his sister, Taylor, had a dose of naloxone in the medicine cabinet. Naloxone, often known by the brand name Narcan, is available as a nasal spray, a pre-loaded injectable shot or in a vial that can be administered with a syringe. When a person overdoses on an opioid, their breathing and pulse slow, leading to brain damage or death. A dose of naloxone stops those effects for 60 to 90 minutes by binding to the brain's opioid receptors and essentially switching them off. Naloxone doesn't "cure" an overdose because opioids remain in the bloodstream for at least four to six hours, but it creates a window during which a person can receive emergency care. “If [Taylor] had had naloxone, if she’d known about it, been trained on it and had that awareness, things might have gone differently with Miles,” McEntee said. When Miles died, naloxone was only available in Texas to people with a doctor's prescription. Beginning Tuesday morning, Texans will be able to obtain naloxone without a prescription at any of 715 Walgreens pharmacies in the state, Walgreens spokesman Phil Caruso confirmed. The change comes because of Senate Bill 1462, which took effect last September, authorizing doctors to write a standing order allowing anyone to get the drug; Texas is one of 33 states with such a law on the books. Alicia Kowalchuk, an assistant professor at Baylor College of Medicine, wrote the standing order for Walgreens pharmacies in May. Last week, the Texas Pharmacy Association announced it has issued a statewide standing order that will allow all pharmacists who complete an hourlong training course to administer naloxone. Public health workers and activists are hailing it as a major step forward in Texas’s fight against the opioid epidemic. The rate of drug overdose deaths in Texas — 9.68 per 100,000 people — is lower than the national rate of 14.68, according to the Centers for Disease Control and Prevention. But the state also is home to four of the country’s 25 cities with the highest rates of opioid abuse — Texarkana, Amarillo, Odessa and Longview, according to a report by healthcare information company Castlight Health. And the growing prevalence of prescription painkiller and heroin abuse has driven a dramatic surge in drug overdoses nationally and in the Lone Star State, where the rate of overdose deaths increased 80 percent from 1999 to 2014. “[Naloxone] is great because it prevents people from dying of this disease of opioid abuse,” Kowalchuk said. When the Texas Pharmacy Association order takes effect Aug. 1, the drug will be available for anyone who can afford the $50 to $100 price at any pharmacy that chooses to participate; Medicaid covers naloxone in Texas. Mark Kinzly, co-founder of the Texas Overdose Naloxone Initiative, said the statewide standing order will allow people who might not regularly see a doctor to access naloxone. It also lets family and friends of opioid users to obtain it as a precaution. If they discover a loved one experiencing an overdose, they’ll be prepared to respond. Keeping naloxone nearby is especially important for households where someone has been prescribed an opioid painkiller because many opioid overdoses occur to people who have legitimate prescriptions for the medications, Kowalchuk said. In 2013, the state reported 622 deaths due to opioid overdoses — but the Houston Chronicle and Austin American-Statesman counted 798 prescription drug-related deaths in just five counties, indicating that opioid deaths may be more common in Texas than the official numbers show. Kinzly believes stigma and misconceptions surrounding drug addiction are hampering public policy solutions to the opioid epidemic. Last year, Gov. Greg Abbott vetoed House Bill 225, which would have established a “Good Samaritan” law so that someone calling 911 to report an overdose wouldn’t be prosecuted for possessing a small amount of drugs. Just two legislators voted against the bill. At the time, Abbott issued a statement saying the bill could have been misused by drug dealers and habitual abusers. Jane Maxwell, a research professor at the University of Texas-Austin who has studied drug use in Texas for 40 years, said there’s a direct link between painkillers and heroin use because they affect the brain in similar ways. According to the CDC, deaths from prescription painkillers more than tripled nationwide from 2001 to 2014, while the number of heroin deaths increased sixfold. For Miles McEntee, as for many Americans, prescription painkillers preceded heroin. A wrist injury when he was in high school required surgery and physical therapy, but his family couldn’t afford all the treatments he needed and pain continued to bother him, Kelly McEntee said. Miles, who loved skateboarding and frequently brought home stray animals, started using heroin a few years before he died. To his mother, everything seemed to happen quickly: the painkillers, the heroin, a bright period when he seemed to be doing better, and then his death. Kelly McEntee said she will always wonder what might have happened a year ago if her children had had access to naloxone. Disclosure: The University of Texas at Austin and the Texas Pharmacy Association have been financial supporters of The Texas Tribune. A complete list of Tribune donors and sponsors can be viewed here.